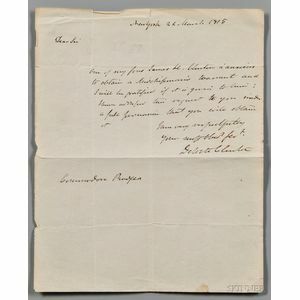 Clinton, DeWitt (1769-1828) Autograph Letter Signed, 22 March 1815. Single sheet of wove paper watermarked C. Wilmott, 1809, inscribed on one page. 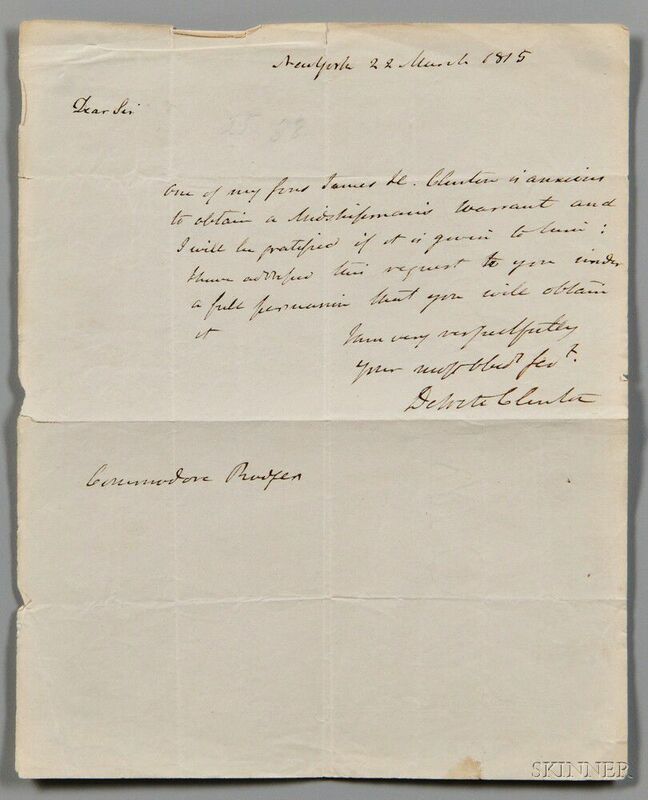 To a Navy Commodore John Rodgers (1772-1838), asking for a midshipman's warrant on behalf of his son James H. Clinton. Old folds, minor short tears, 9 1/2 x 7 3/4 in. Armstrong, Neil (1930-2012) Typed Letter Signed, 7 May 1979, with Additional Material. Arnold, Henry Harley "Hap" (1886-1950) Signed General Pass to the Quebec Conference, August 1943. Artists and Illustrators, Signed Correspondence and Sketches, Three Pieces. Balloon Mail, France, 21 October 1870, Par Ballon Monté. Barbé-Marbois, François (1745-1837) Letter Signed, 7 September 1803. Briggs, Caroline Louise (b. circa 1875) Archive of Photographs, Including a Group from Brown University, c. 1899. British Authors, Five Signed Pieces.